These organic raw cashews are rich and creamy in flavour and texture.They are high on copper, manganese, magnesium, tryptophan and phosphorus. Raw cashews have a lower fat content than most other nuts and approximately 75% of this is unsaturated fatty acids. 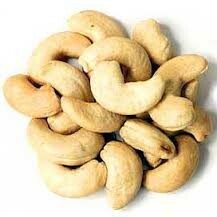 Cashews such as these promote good cardiovascular health. A handful of organic cashews are great to snack or add these cashews in your favourite cereal, muesli or trail mix. Also great for baking and stir-fries.